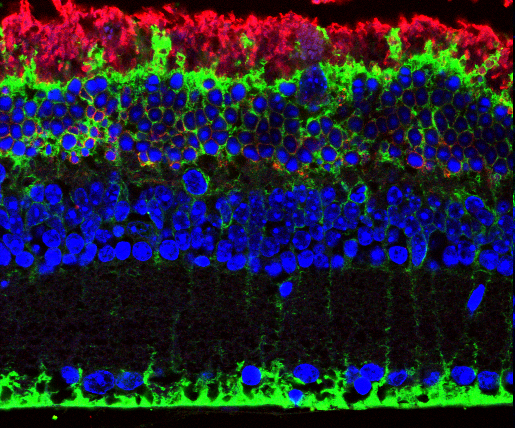 Researchers at the Centre for Genomic Regulation demonstrate that retinal cells can be reprogrammed in vivo into retinal precursors that then differentiate into photoreceptors. The study, published this week in the Journal of Clinical Investigation, takes a step towards preventing retinal degeneration in murine retinitis pigmentosa. Retinitis pigmentosa covers a group of rare genetic disorders that cause retinal degeneration due to a loss of photoreceptors, the specialized cell-sensitive neurons that enable eyesight. The therapeutic approaches currently available for the treatment of this kind of blindness are very limited. Many efforts have been made to block or delay degeneration of photoreceptors. However, to date, very limited success has been obtained in their regeneration in mouse models. Now, a team of researchers led by Dr Pia Cosma, ICREA research professor at the Centre for Genomic Regulation (CRG) in Barcelona, Spain, in collaboration with the Aragon Health Sciences Institute, the University of Zaragoza, and Ferrer International, have identified a route for cell reprogramming to functionally regenerate photoreceptors in a murine model of retinitis pigmentosa. “Our work demonstrates that it is possible to reprogramme retinal Müller glia cells into neurons, which might represent a therapeutic strategy for reversing retinal degeneration,” states Dr Daniela Sanges, postdoctoral fellow in Dr Cosma’s laboratory responsible for conducting most of the experiments behind the study. Cosma and her team have been working on retina regeneration for many years. In previous work, they described a signalling pathway (Wnt) that, once activated, allows the neurons to be reprogrammed through cell fusion with cells derived from bone marrow. Now, they are applying their knowledge to retinal degeneration in murine retinitis pigmentosa and describe, for the first time, reprogramming of Müller glia cells into photoreceptors. “It would not have been possible to demonstrate that retina glial cells can be reprogrammed in vivo and, in turn, efficiently differentiated into photoreceptors without our previous work. There are many steps to follow and you need to know each one perfectly,” states Sanges. Transplant of Wnt-activated hematopoietic stem cells into retinas affected by photoreceptor degeneration. This will lead to spontaneous cell fusion events between Müller glia cells and the transplanted stem cells, giving rise to hybrid cells. Activation of the Wnt signalling pathway. This pathway is a series of biochemical reactions produced in cells. In frogs or lizards, for example, these reactions are what allows their extremities to regenerate if the animal gets hurt. Although for the most part, humans and other mammals have lost this regenerative capacity, the Wnt pathway is involved in numerous processes during embryonic development. The activation of the Wnt pathway is also essential in the process of somatic cell reprogramming, where it enhances survival and proliferation of Muller-Hematopoietic hybrid stem cells. Differentiation of hybrid cells into photoreceptors. The hybrids become photoreceptors and the retina is partially regenerated. In short, thanks to this work a new route for reprogramming Müller glia cells into photoreceptors in mice is available, and may potentially be exploited in the future for new treatment approaches. However, to apply this therapy to patients, the efficacy of human hematopoietic stem cells in reprogramming human Müller glia cells after fusion requires further study. Again, it is extremely important to take steps forward and, though we are still unable to apply this discovery to human treatment, it is an encouraging and absolutely necessary first step. Funding: This work was supported by an ERC grant (242630-RERE to M.P. Cosma), the Spanish Ministry of Economy and Competitiveness and FEDER (SAF2011-28580, BFU2015-71984, BFU2015-71984-ERC), a grant from the Economy and Knowledge at the Generalitat de Catalunya (2014SGR1137), Velux Stiftung (to M.P. Cosma), the FUNDACIO MARATO TV3, Ferrer International, and the Juan de la Cierva Programme.